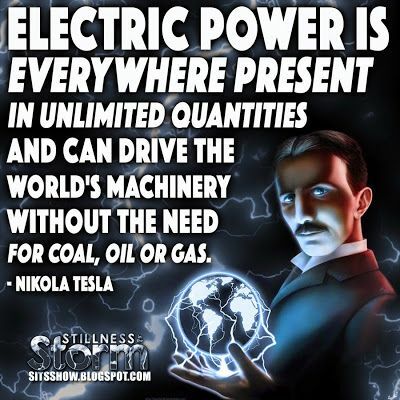 Tesla´s free energy theory claiming that certain special interest groups are suppressing, or have suppressed in the past, technologies that would or could provide energy at reduced costs, reduced pollution output, or would or could reduce the energy consumption of various devices. Most of the free energy devices in question have been invented by Nikola Tesla, so he is the most representative figure of this movement. Groups most often implicated in such activity are the oil industry, petroleum, national governments and, additionally, automakers. The most common perceived motive is preservation of the economic status quo and sustained increase of fuel prices. Dependence upon expensive energy is perpetuated by governments in order to control the populace by means of hydraulic despotism. The principal belief is that electric companies, gas heating companies and oil companies would lose half or more of their profits with free energy available. Therefore, these companies donate millions to governments (bribing them) to make sure that free energy devices stay out of the public market. Tactics and means of suppression include buying the patent of the free energy device from the inventor or his family, suing the inventor or patent holder and even murdering the inventor in some cases. Based on the principles of capitalism, free energy cannot be allowed. The traditional economic system contains three aspects: capital, goods and services. Within the aspects of capital are three subcomponents: currency, credit, and natural capital. Natural capital comprises raw material and energy. This differs considerably from the orthodox definition of capital in economics. By reviewing history it is understandable why some inventions are not commercialized. It is economics, not science, that is the main factor. It will be remembered that alternating current was opposed by powerful financiers in Tesla’s time. Westinghouse promoted his DC, Tesla his AC. Thankfully Tesla won that battle. Tesla is the key player in Free Energy Theories. Below is his proposal. In 1901 Tesla believed that neutron particles were responsible for all radioactive reactions. Radiant matter is in tune with these neutron particles. Radiant matter is simply a re-transmitter of energy from one state to another. Tesla’s intent was to condense the energy trapped between the earth and its upper atmosphere and to transform it into an electric current. He pictured the sun as an immense ball of electricity, positively charged with a potential of some 200 billion volts. The earth, on the other hand, is charged with negative electricity. The tremendous electrical force between these two bodies constituted, at least in part, what he called cosmic energy. It varied from night to day and from season to season but it is always present. The positive particles are stopped at the ionosphere and between it and the negative charges in the ground, a distance of 60 miles, there is a large difference of voltage – something on the order of 360,000 volts. With the gases of the atmosphere acting as an insulator between these two opposite stores of electrical charges, the region between the ground and the edge of space traps a great deal of energy. Despite the large size of the planet, it is electrically like a capacitor which keeps positive and negative charges apart by using the air as a non-conducting material as an insulator. The earth has a charge of 96,500 coulombs. With a potential of 360,000 volts, the earth constitutes a capacitor of .25 farads (farads = coulombs/volts). If the formula for calculating the energy stored in a capacitor (E =1/2CV2) is applied to the earth, it turns out that the ambient medium contains 1.6 x 1011 joules or 4.5 megawatt-hours of electrical energy. In order to utilize this high-voltage energy you must do two things — make an energy sink and then devise a way of making the “sink” oscillate. Such a “sink” has to be at a lower energy state than the surrounding medium and, for the energy to continually flow into it, the energy must be continually pumped out. Additionally, this “sink” must maintain a lower energy state while meeting the power requirements of the load attached to it. Electrical energy, watt-seconds, is a product of volts x amps x seconds. Because the period of oscillation does not change, either voltage or current has to be the variable in this system’s energy equation. Bifilar coils are used in the system because a bifilar wound coil maximizes the voltage difference between its turns, the current is then minimized. Set the bifilar coil into oscillation at its resonant frequency by an external power source. During the “zero-point” cycle the bifilar coil will appear as one plate of a capacitor. As voltage across the coil increases, the amount of charge it can siphon will increase. The energy that is taken into the coil through the small energy window (zero-point), appears to be the key to the success of this system. It is at this zero-point where energy is condensed into positive and negative. When energy escapes from the “sink” the magnetic field collapses and a strong magnetic quake is created. Tesla’s free energy system is a self-oscillating capacitive system. Very little power is expended keeping it going. A small amount of charge moves through the system per cycle, that is, the coulomb per seconds = amps are low. If the charge is used at a low rate, the energy stored in the system will be turned into heat at a slow rate enabling the oscillations to continue for a long period of time. Tesla’s “COIL FOR ELECTRO MAGNETS,” patent #512,340 is a very special bifilar coil design because, unlike an ordinary coil made by turning wire on a tube form, this one uses two wires laid next to each other on a form but with the end of the first one connected to the beginning of the second one. In this patent Tesla explains that the double coil will store many times the energy of a conventional coil. A bifilar coil is capable of holding more charge than a single wound coil. When operated at resonance, the distributed capacitance of the bifilar coil is able to overcome the counter – electromotive force (e.m.f.) normal to coils, inductive reactance. Because of the electrical activity, a bifilar coil does not work against itself and the potential across the coil quickly builds to a high value. The difference between the turns becomes great enough that the energy is practically all potential, at this point, the system becomes an electrostatic oscillator. A standard bifilar coil of 1000 turns with a potential of 100 volts will have a difference of .1 volt between turns. A similar bifilar coil will have a potential of 50 volts between turns. Stored energy is a function of the square of the voltages the energy. That equates to 502/.12 = 2500/.01 = 250,000 times greater than the standard coil. I have harnessed the cosmic rays and caused them to operate a motive device…The attractive features of the cosmic rays is their constancy. They shower down on us throughout the whole 24 hours…it will not require devices for storing energy as would be necessary with devices using wind, tide or sunlight…They move with great velocity, exceeding that of light…the cosmic ray ionizes the air, setting free many charges ions and electrons. These charges are captured in a condenser which is made to discharge through the circuit of the motor. 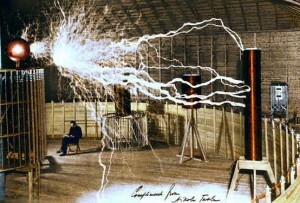 Tesla’s first radiant energy receiver stored static electricity obtained from the air and converted it to a usable form. Tesla’s invention is a simple version of T.H. Moray’s device. Moray’s device used a unique rectifier (RE-valve) to efficiently capture the static electricity from the surrounding air. Moray’s oscillator tubes (magnetron transducers) utilized this high-voltage energy to generate an internal secondary “cold” fusion reaction. Stick an antenna up in the air, the higher the better, and wire it to one side of a capacitor, the other going to a good earth ground, and the potential difference will then charge the capacitor. Connect across the capacitor some sort of switching device so that it can be discharged at rhythmic intervals, and you have an oscillating electric output. T.H. Moray simply expanded on Tesla’s idea to use high-voltage to create ionic oscillation. He is directly converting ionized particles generated by radiant matter. Radiant Energy is directly converted to electrical power! It is this transfer of energy that could be used for practical purposes. Tesla was once a household word, sixty or seventy years ago. Why were his acheivements virtually stricken from history almost the day after his death. What did Tesla discover which threatened the powers that be? Since we already know about the many patented inventions, the assumption has always been that the unknown, still classified works were far in advance of the published ones, and were in realization of projects about which Tesla had announced he was working on, or had already tested and developed, but had not yet given to the world. There have been countless speculations as to what Tesla’s free energy discoveries were. At the time of his death, there were in all, the approximate equivalent of a railroad boxcar load of Tesla materials confiscated by the FBI, from around four different storage locations and Tesla’s hotel storage and hotel room and safe. Of this, a total of only about 150,000 documents were released to Tesla’s Yugoslavian relatives, now held by the Tesla Institute in Belgrade. The remainder of Tesla’s papers are still classified, literally tons of notes, documents, drawings, and plans. The government distributed false rumors that “Tesla never kept notes”, which was a blatant lie. Odd behaviour given Tesla’s repeatedly unsuccessful efforts to get the attention of the war department, met with ignorance and shoddy treatment. It was not until after it came to their attention in 1942, that the Nazis were building flying saucers and other ‘fantasy’ weapons based on Tesla’s inventions, that the U. S. Government became so concerned. So why hide something from the American public today which the Nazis stole before 1934? In the case of (flying saucer) electro-propulsion, this invention is not only classified, but the very existence of it is categorically denied by the government, while its covert agents in the UFOlogy community attribute it to extraterrestrial, “alien” origins. What better way to deter civilian scientific investigation into the obvious?